I do believe in responsible hunting. Not trophy hunting, where animals are hunted for display purposes, and prime animals are picked off and removed from the gene pool prematurely. Not flush-hunting, where a bunch of people go in with 4×4 vehicles, make a ton of noise and scare all the prey animals to one end of the forest where the humans are waiting with guns. And certainly not spring bear hunts, baby seal hunts, canned hunts, gross abuse and over-harvesting. There is a big difference between hunting as part of your relationship with the natural world, as part of a traditional and sustainable means of occupying our planet, and hunting for bragging rights, tourism, and testosterone. Real hunters know the difference. Sadly, irresponsible hunting and over-harvesting has given all hunting a bad repuration. In my father’s day, hunting was a traditional part of the average Canadian’s ability to sustain their families, at least in rural areas outside of cities. When he left to hunt rabbits, partridge or deer, he’d check in on the neighbours to see what they needed. Rabbits used to be incredibly easy to harvest. You would literally “go out and get a rabbit”. There are many different methods of hunting. The fur trade created a lot of waste, and a lot of unnecessary suffering for wild animals. Snares for rabbits, when properly set, would kill them before they even knew what happened. A good bow hunter could drop a deer without disturbing the rest of the herd. An elk can help feed a family for a year. Wild animals are often healthier than our farmed animals. They don’t grow up on feedlots, they live on huge territories, expressing every element of their natural beings. For all prey animals, being hunted is a part of their life, and humans are not the only ones who hunt them. Farming has taken over hunting, and factory farming has added a new imbalance for our animal friends. I believe in farming too, but I also believe in hunting, and in permaculture. If we manage our wild places in the way they were traditionally managed by our nations First Peoples, we can find the land yields a LOT more food than it can possibly produce while we farm it. This is why fencing off property and tilling the soil seemed like an insane idea to most First Nations people. I think I’ve talked about how, as an animal communicator, I’ve really tried to go vegetarian. I was veg and then vegan for years, until my dreams, my body and my cravings brought me back to eating meat. That return convinced me that my particular body doesn’t want to go without meat. I can survive without it, but I can’t really thrive. I did learn a lot though, and returning to a diet that includes meat has forced me to learn even more. Maybe it’s because my father was a hunter, a real hunter, that I’ve always believed we should be utilizing the forests in a more responsible way. Understanding responsible, respectful hunting helps me see hunting as a way to improve animal welfare, and create balance with our environment in general. There was a big uproar this past week in my hometown of Ucluelet, when a man was caught and convicted of poaching from a newly re-established elk herd not far from my home. The elk used to live here, and were hunted to oblivion, except in the north end of the island. The First Nations communities are generally working together to bring this traditional food source back to our area… and so they were outraged when the Ucluelet hereditary Chief was caught poaching these elk out of season. He has been removed as chief, an extremely rare occurrence – this shows the seriousness of the poaching offence. In this week’s podcast, I read a piece shared from a lovely Tla-o-qui-aht First Nations lady named Tsimka Martin, as she tells the story of her people’s traditional whale hunt. Whale hunting now is associated with massive industrialized vessels, overharvesting, and inhumane slaughter. Yet whale hunting was not always so. The whale hunt used to be an essential part of survival for the First People of Vancouver Island, and the Tla-o-qui-aht were famously skilled. I’ve seen the dugout whaling canoes, carved by Tsimka’s family. They’re huge – but not compared to a whale. Although the canoes would be filled with strong hunters, a whale is a good match. These people did not harvest the animals from a place of entitlement, they asked for sustenance and received permission. Telepathic animal communication and prayer were even more important than the strength of the hunters and the sharpness of the harpoon. Please listen to Tsimka’s story, and think about humanity’s relationship with the environment, with the animals that sustain us. Think about hunting, what is it, and what it could be. Here, the traditional whale hunt is no longer practiced. In the Ucluelet / Tofino area, we are extremely fortunate to have access to culture sharing by the original people who have lived on this land for longer than recorded human history. These incredible survivors of colonialism and genocide have kept stories such as these sacred and secret – and now have begun to share the history they have saved. Through this culture sharing we discover that animal communication was essential to the survival of the Nuuchahnulth peoples. Tsimka Martin, a woman of Tla-o-qui-aht heritage, shares an important part of her culture in the March 2016 Tofino Times. This wonderful article is shared in this episode. whale hunts in Anne Cameron’s book, Daughters of Copper Woman. You can buy that book here. You can watch a video of Tsimka Martin on one of her traditional paddle school excursions here. You can see some photos along with another version of Tsimka’s article here. If you visit Tofino, you can go out on a traditional canoe with Tsimka or a member of her community through the T’ashii Paddle School here. 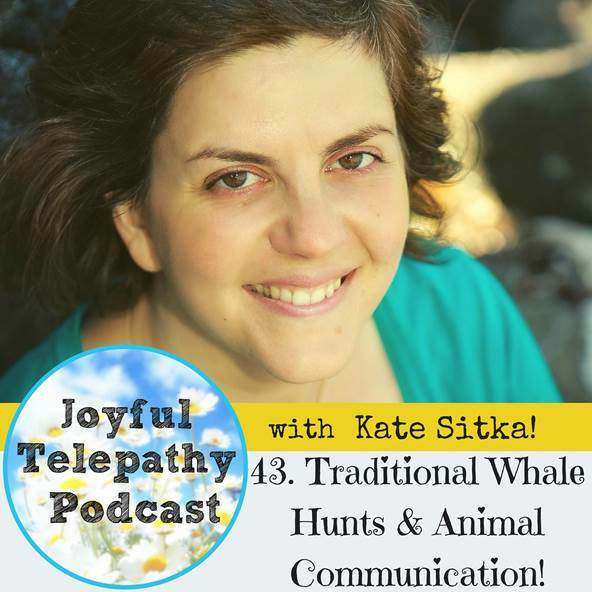 Kate Sitka is an Animal Communicator & Spirit Medium located in Tofino, BC. Book a Session with Kate here! Questions? Comments about the episode? We love your feedback! ← New Episode PLUS! Other new stuff! I agree completely. I’ve never felt comfortable going on trophy hunts. My family’s hunting was predominantly for food. We fished when we wanted a fish fry. We would hunt deer once a year. A full sized deer would provide meat for a long time. It was the same with ducks and turkeys. Only for consumption. I had a couple of uncles that would have a large bass mounted on the wall. Or several ducks. But they were artists who would use the specimens for studying. I must agree that hunters, by and large, do actually love the wild animals and the outdoors. And ironically, the money they spend does ho a long way to pay for the care and preservation of wild habitats. If any species of game becomes scarce and endangered, they eagerly work with Wild Life Management to rescue the animals. It may seem strange to people who don’t hunt. How someone could kill these beautiful creatures. I’ve never truthfully enjoyed it. Even for the purpose of consumption. But just like with the Native Americans before us. If it’s kept within a balance, then perhaps its it so unnatural. Yes. I’ve tried to explain this to others as well. Ducks Unlimited has saved thousands of acres of wetland, all funded by hunters protecting the ecosystem. I grew up in a place where trophy hunting (and giving away the meat because your family won’t eat game) and consuming factory farmed animals is not given a second thought. I’m quite a bit older than you, Kate, and have struggled most of my life with my feelings about animals and eating them and mostly a lot of discomfort around my veg then vegan tendencies. I’m currently plant-based and feeling okay with coming out. Anyway, I totally agree what you’ve expressed here and will always adhere to each to his own though I Wish people would eat according to what is naturally available in their locale. For the earth’s and all our sake. Yes. I think I’ll go out and buy some fish!